Thursday December 21st 1899 I dressed a turkey for Fannie the first thing and then Will and I picked eleven ducks. and he churned for me. I got the butter weighed after supper and dressed one of the ducks for our own use tomorrow and we caught a few turkeys. I packed my things for the tree before going to bed. It has been a hard days work. Weather fine. Friday December 22nd 1899 I helped Will catch the rest of the turkeys and tie them and get things in ready to go to town. I cleaned up the house some and got a nice dinner. Mrs Sanders and Mrs Allen Hiatt were down to dinner. Will did not come home till the middle of the afternoon. I read in evening. Saturday December 23d 1899 I was busy about the house all morning and did some mending in the afternoon and evening. Will was busy about the place all day. The Jessey twin had a fine white face calf it is just a week younger than Old Jesseys. 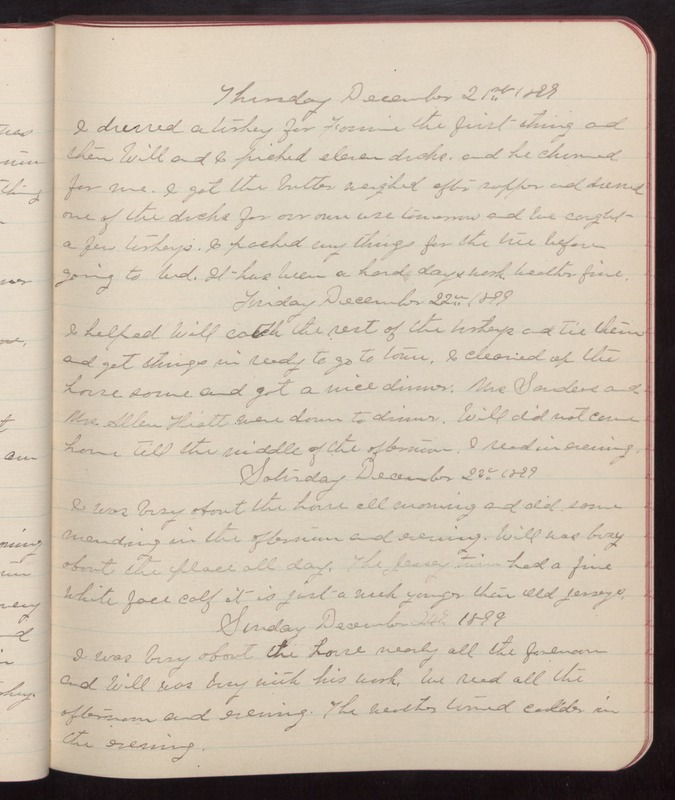 Sunday December 24th 1899 I was busy about the house nearly all the forenoon and Will was busy with his work. We read all the afternoon and evening. The weather turned colder in the evening.